I really like the Nespresso coffee from my new Nespresso pod coffee machine. But I am a bit annoyed by the inconsistent amount of coffee that ends up in the cup. The Nespresso pod coffee machine comes with two preset delivery volumes for espresso size and lungo size. By default, the espresso size is 40ml and the lungo size is 110ml. In addition to the pod coffee machine, I bought some of the Nespresso branded glass cups to enjoy my coffee in. With the cups being see-through, you can very easily see the volume of coffee dispensed by the machine. The amount of coffee produced, and therefore the depth of coffee in the glass cup, seems to vary quite a lot from one coffee to the next. While this is a small annoyance, it is frustrating nonetheless. If you hold down the espresso or lungo buttons, you can adjust the delivery amount of coffee as desired, so you are not limited by the factory settings. However although this allows you to increase or decrease the amount of liquid that comes from the pod coffee machine, it does not fix the problem of inconsistent delivery volume. When you warm the cup, a larger amount of water is delivered and you can adjust this so that the small cup is filled. But when you lift the lever on the pod coffee machine, insert the Nespresso pod and press the same button to make your coffee, a significantly smaller volume of coffee is produced. The cup is nowhere near being filled, perhaps four fifths full. And this smaller volume of coffee seems to vary for seemingly unknown reasons from one coffee to the next. Not by huge amounts but noticeable from one coffee to the next. If you made five of these in a row, your guests might wonder why some of them are more favoured than the others with more coffee. This seems strange given that the coffee is machine made, rather than judged by human eye. You could adjust the delivery volume to produce even more coffee and fill the cup, but this would result in an overflow when just warming the cups with hot water (no pod inserted). Any tips for a more consistent Nespresso coffee delivery amount? I bought my coffee machine in Lidi in Dublin @ the Swords Rd store. It’s the Bellarom Coffee machine. I think it is only a new machine. When I got it the thing worked find. But then it started to give out an inch of water in the cup then it would make weird sounds like the water was hitting the hot plate, that was the sound it was making. I do not know why. I tried to flush the pipes and all is fine. The water comes out like it should, but when i use the capsules, a tiny bit comes out and then the loud grown like it is struggling to work. This is my first machine of this kind and it is really annoying me as to why. It is only a new machine.. This amount of money takes me a few weeks to save. Any help as to why this is happening. Oh, and the water that does not go into the cup ends up in the spill tray. The tray does be full up after just trying to make one cup. Only about an inch of water does be in the cup and the rest in the tray. I can see the water running into the tray because of it is all see-through. This is the last time I am buying anything from Lidi and I am never buying one of these machines again. I made myself broke because I wanted to get this and now I am screwed.. I read with interest all the comments about POD machines. Biggest problem is cleanliness inside the POD area. Water quality varies all over the place, even here in Melbourne, (we have been voted by someone(?) as having the best and cleanest water in the world), but when ever I get inconsistent volume of coffee, I do a decalcify and the problem goes away. Whether you use a DeLongi or Aldi type unit, or any other, KEEP THEM CLEAN. I have the Virtuoline but it doesn’t have a lever that goes up and down, only a lock handle that goes from side to side. What can I do to solve this problem? I was on tech support twice, but they couldn’t hel; me. Every time you say expresso instead of espresso one poor Italian guy falls of his Vespa. So please, try not to say it wrong. Thank you! Thanks for the best laugh I’ve had in awhile. Further to the previous… I used a toothbrush as a scrubber. i had this problem and rang the Nespresso help-line. They suggested opening the lever or slide and cleaning the surface which the front of the pod presses against, pushing the button and running the water through (as if you had put a pod in and were making a cup of coffee). Repeat that cleaning process ten times. It worked. Apparently, small flakes of ground coffee can build up in the front-facing area, that is the area of the machine against which the front of the pod presses. Hope this makes sense. Worked a treat – I have been restoring factory settings and it was still dispensing minimal amounts when pressing Lungo – seems after a little clean and wash through we are back in the coffee game! Thank you. thanks so much, Jonathan, that has worked for me! The problem with my machine is that it consistently crushes the pods and we get maybe a 65% success rate on actually using these damed pods. It is finicky beyond belief ! Help !!!!! Thank you it was just the info i was looking for. Just got mine as a present and to start with it was dispensing half a mug when I pressed Lungo button. But thanks to you its me not the Merchine at fault. Also i have found that the Aldi coffee pods tast the best and as a bonus there are a lot cheaper. Dave Drew. Crawley West Sussex. Wow, Aldo has pods that work Nespresso? Great info. 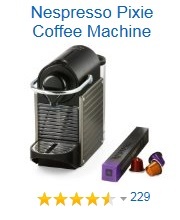 I bought at Kroger’s pods that said it was Nespresso compatible. Was not the case & I returned. I buy only Lungos. Meanwhile my volume is not say terrific, also. Personally I would urge people not to buy the Inissia model. The first one I bought through Amazon a month ago started to fill an espresso cup only 1/2 way . That started happening after just a week. I returned it and got another one. After 3 days this one is doing the same thing. I don’t see how it can calcify after 3 days. I have to hold the button down to fill the cup. It fills inconsistently and yes it is annoying. And obviously it’s happening to a lot of people. Most of the Nespresso machines can be “calibrated” for volume. In most cases you simply hold down the Espresso button till your cup fills to just shy of the volume you want on that setting (there is some “overshoot”) then release the button. Do this again for the Lunge setting. If you made the mistake like I did of holding down the button to “top-off” the cup in the past you will inadvertently changed the calibration and have to re-calibrate your machine. I ran through a container of water before I learned how to quit as the cup will continue to fill a bit after release sort of like shooting ducks you have to learn to “lead” it a bit. Also I ONLY use distilled water in mine this avoids the “calcification” ( mineral build-up) problem. Dave is right. You can calibrate your coffee to the taste or volume that you require. I use RO water for my coffee. Weeelll … I’ve owned and used about thrice daily my ruby-red inissia for about 4 years. In country South Australia earlier this year I used tap water until machine decided it wasn’t going to work. Bought spring water and immediatelyp problem solved. As I travel with machine the original carton broke so shortened packaging and now machine lives in a Coles shopper bag. I must have bumped it in transit xce wouldn’t work this morning. This helpful websites directions for holding both buttons worked a treat and now I’m happy with my 2-3 cuppas per day, again. Thankyou people of this site. ps…I find L’OR papuan the best. How to clean out nespresso machine for calcifications . I bought a new Citiz about 3 weeks ago. I tend to drink lungo most, and I’ve had great coffee until last couple of days. I now have to use a bigger cup, or it will overflow the lungo size cup, also the coffee is weaker because of more water. 1. With machine being turned off (ie. Led lights not on), press and hold down the Lungo button for 5 seconds. 2. LEDs will blink fast 3 times to confirm machine has been reset to factory settings. 3. LEDs will then continue to blink normally, as heating up, until ready. Steady lights = machine ready. 4. Factory settings: Espresso Cup: 40ml, Lungo Cup: 110 ml, Power Off mode: 9 mins. You’ve accidentally adjusted the amount of water delivered by holding the button down – it “remembers” this as your preferred amount of water. Do a reset. Very disappointed with this machine, same problem as above. Small volumes of coffee, sometimes more out of the expresso one than the lungo one. My machine start having problem today, the problem is when I start to make coffee, I found the coffee liquid come out internaly, which means My cup could not get any coffee liquid. I have tried few time, even I turned off the machine for few minutes ts, and start again. The problem still the same. Please advice me what I should do. Mine is doing the same thing ? So is mine and they said it is all to with the pods. You can use Nespresso pods not the ones that say they are are nespresso compatible. I’ve tried several brands other than nestle: Fine Coffee Club are the least consistent IMO, sometimes you get almost nothing out of them, and I like CafePod a lot. Some great tasting coffee and more reliable pods. My oldest nespresso machine started to have these sort of problems the one shot is more like 2 shots…. and the double shot is a short expresso that comes out in spurs…. I have had two yellow machines and both of them crushed the pods when inserted with no coffee delivery. I have now upgraded to a Citiz model which seems to work . Doesn’t anybody check these machines before they are packaged for sale? I have written to customer service but that doesn’t seem to exist. Every picture tells a story. I have used my coffee machine for a year, and the inconsistant level of coffee is annoying. I have tried doing a cleaning cycle and will try to clean the plastic punches and will reply if it gets better. So if the machine has become faulty after having it for abut 3 years…any suggestions in regards to repair? I have just experienced this low water flow. I have the same problem. Have u managed to solve it. This is a calcification issue. Order the de calcification pouch from the coffee concierge at Nespresso Customer Services. Like any coffee brewer maintenance of calcium is important. I just bought the newest version of Nespresso “VertuoLine Chrome Bundle ” which includes the Aeroccino. I absolutely love the coffee and cappuccinos and lattes we can make. I actually fooled a few of my girlfriend’s one day by making them in to.go cups we bought at the store and adding some extracts (vanilla, almond, pumpkin whip cream on top). I told them a new coffee shop opened up near my house and I was treating. I didn’t reveal that it was Nespresso until after i saw their reactions. Every single one of them were impressed ! 4 awesome coffees cost me about $7 total even after cost of whip cream extracts disposable cups! We all know that had i gone to the “star” coffee shop (which I do love the coffees but not the cost and the waiting in line when im in a hurry), it would have cost me about $16- $20. You do the math. My friend just bought hers today 11/3/16 at BBB for $161.00 after the sale price ($187 and a 20% coupon)! What a killer deal!!!!! Our problem is that our Nespresso we use on our boat in the Uk makes coffee which is far too long…. I am also laughing like an idiot, it’s spelt espresso, not expresso. I think you should learn how to spell the relevant terminology before you wax intellectual about it. Haha, Tom M…I thought the same thing. I would love to hear them pronounce filet mignon or Merlot. Oh Lucia living in Italy and calling it expresso we all know it’s espresso . This machine is brand new. It has been embarrassing with guests over. It makes great coffee but the volume is ridiculously low, and I’ve tried the reprogramming and holding down the button. I’ve read the diction 10 times to see if I’m missing something. The video makes it very obvious how it works, but not working for me.it is extremely annoying! ! I’m having the same problem wit coffe volume and it is very annoying . I can’t seem to fix it. The long button produces maybe 50 ml of coffee.please help. I cannot see how old this question is. Maybe it’s 10 years old! Anyway, the coffee capsule once inserted presents an additional obstacle to the water flowing out, so naturally you will get less water with a capsule rather than without. Another issue maybe the front part of the capsule assembly, the plastic surface that presses and pierces the aluminium foil at the front of the capsule, gets clogged with coffee and that might also decrease the amount of water you get in the cup. You can clean it by using a hard bristle toothbrush, preferably small head. It may also be that the machine is faulty – there is a pressure valve and a water pump, either of them may have been damaged/worn/scale build up etc.